(IEC 61162-1, IEC 61162-2) signal, or other signals in the serial transmission of data via the RS-232 and RS-422. Nowadays there are a lot of recipients of the NMEA 0183 data on a ship’s bridge. Thus in case of new equipment installation (such as GPS receiver, AIS transponder, Gyro etc) it is recommended to add NMEA Converter / Distributor Unit at once. This would make easier future connection of various radio and navigation equipment (VDR, ECDIS, GMDSS radios, PCs etc) and allow to increase reliability of the NMEA data source. More over use of the direct output signal from conventional equipment for private purposes is strictly prohibited under some authorities. 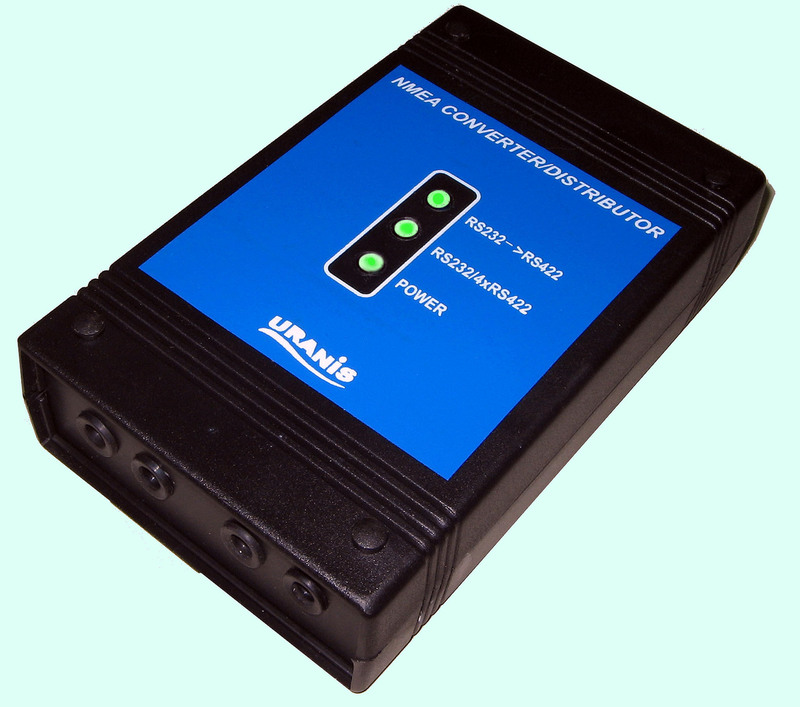 NMEA Converter / Distributor unit provides complete galvanic isolation for all input and output ports, protection devices from accidental short circuit and from damages related with the lack of connect between GND and Common wire. The design of the unit provides protection against reverse voltage supply, as well as overload protection and the appearance of spurious emission generation output ports. Three LEDs allow watching the active state of the supply chains and output signals. Unit is easily configured using the four-way DIP-switch on the PCB. NMEA Converter / Distributor unit is rugged, lightweight plastic casing, which can be mounted on the ceiling, bulkhead indoor.